Camp Richardson in South Lake Tahoe is a historic resort that has been manned since the late 1800’s. 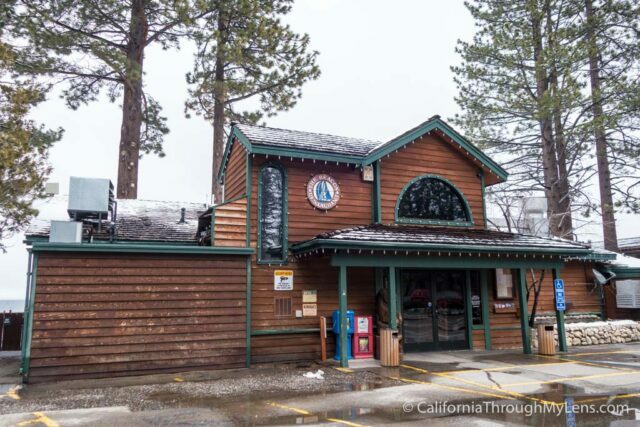 Today it is a bustling center of adventure, history, and activities in Lake Tahoe. 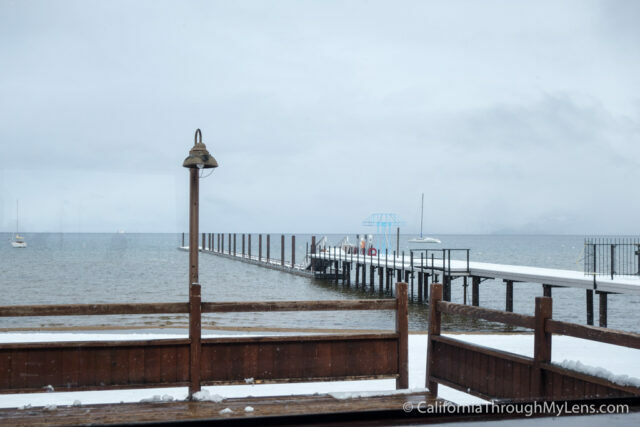 During the summer, the beach is full of people sipping Rum Runners and casually soaking in the sun on the beach, while in the winter it is a serene wonderland of snow with smooth water lapping at the white shores. Both are equally amazing yet infinitely different experiences. The main restaurant on the property sits right on that beach, and it is called Beacon Bar & Grill. 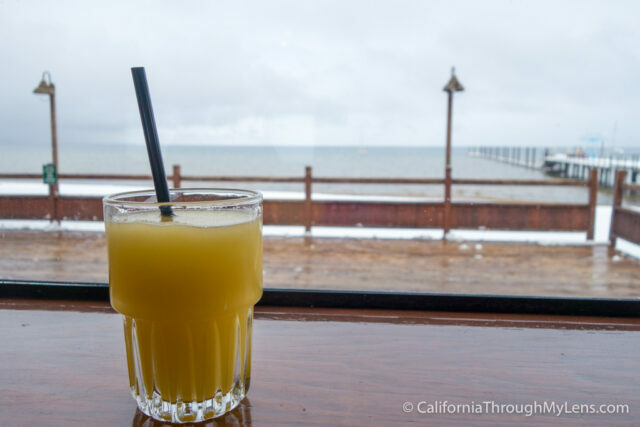 I had a chance to visiting on a cold, snowy day for lunch, and it was fantastic, here is all the information. 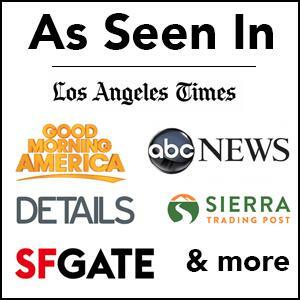 Camp Richardson is located about 15 minutes outside of the downtown area of South Lake Tahoe. 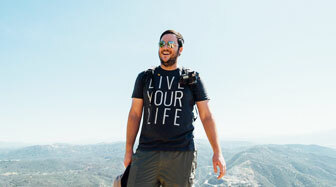 It is a beautiful drive that takes you out of the hustle and bustle of the city and into the surrounding wilderness. It is easy to find, and when you reach the main lodge, you will turn in and drive down towards the beach, which is where the Beacon is located. The restaurant is comprised of the main dining room and small bar area. It is not very big so it can get full fast during the busy times (summer), but in the winter months, it is not usually too hard to get a table. The interior is minimal in its design style, choosing to highlight the large windows which provide a stunning view of the lake only 30 or so feet from the patio. 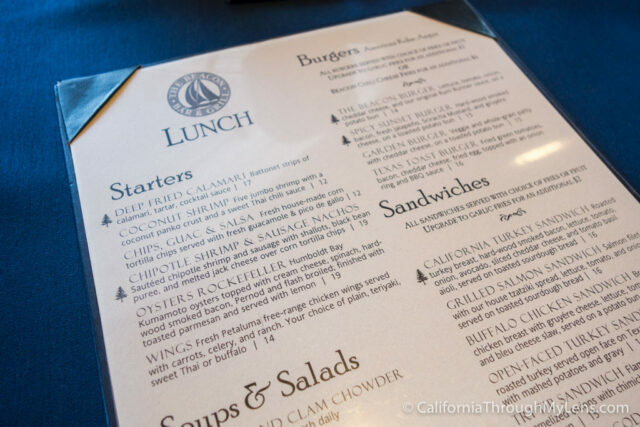 The menu ranges from traditional options like burgers and sandwiches to more unique items like oysters and ahi. I asked for recommendations as I didn’t even know where to start and eventually ended up with the below items. Rum Runner – First off my wife had to try the official drink of Camp Richardson, it is fruity and flavorful, perfect for a warm summer day, but surprisingly refreshing in the cold of winter as well. 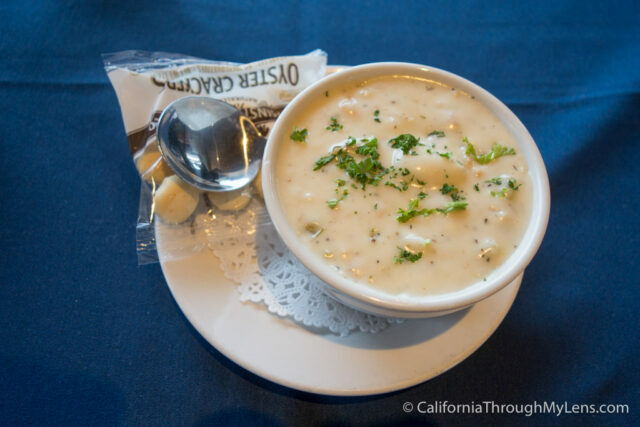 Clam Chowder – A good creamy chowder with nice sized pieces of clams, an easy recommendation when it’s cold. 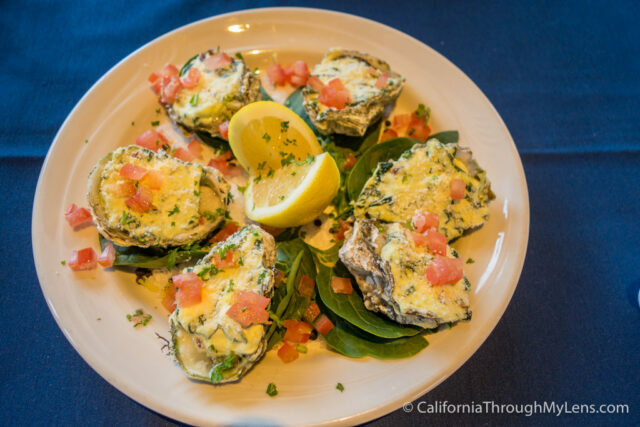 Oysters Rockefeller – I have trouble skipping oysters if they are ever on the menu, and this was no different. The oysters were prepared well and were decadent just like oysters Rockefeller should be. Cooked with spinach; bacon and tomatoes, I couldn’t eat these fast enough. Sausage Shrimp Chipotle Nachos – I ended up choosing this as my entree as it just sounded unique. Be sure to have someone or a couple of people to share it with as it is massive. It is so full of flavor, with delicious shrimp, smoked sausage and a great spice from the chipotle sauce. The best thing I had here for sure. 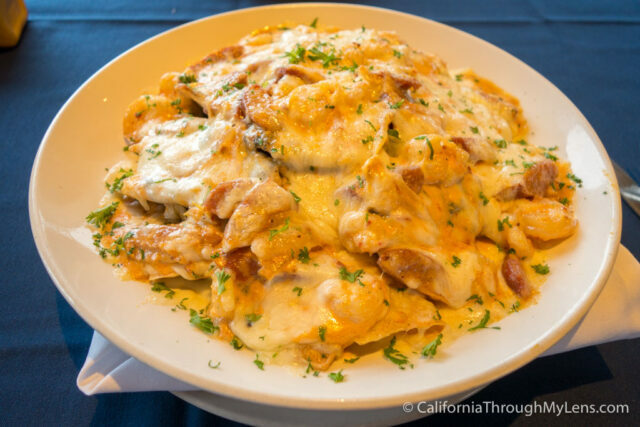 It does seem expensive for a nacho appetizer, but there is a lot of shrimp and sausage, plus two men could have this as their meal and be full. Easily worth the price to me and one of the most popular items on the menu. Ahi Salad – Not the traditional ahi salad you would expect, this had ahi, soft noodles with a crunchy top and a sweet seaweed type salad on the side. There is a carrot ginger purée that is lightly added to the dish as well. 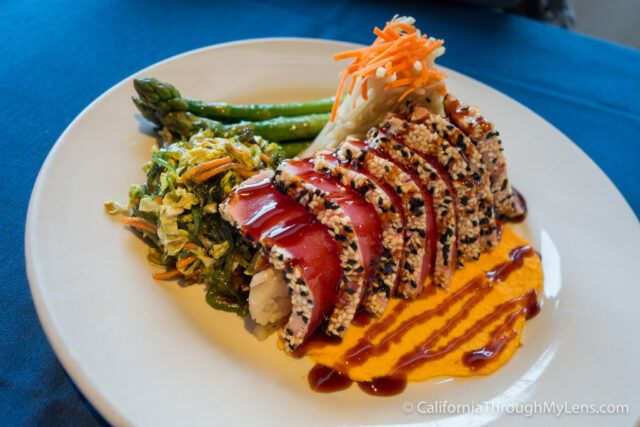 They give you ample portions of the ahi and all the flavors mix well together. It’s pretty much everything you could want in an ahi salad. It’s more of an entree than a salad, and it has a strong Asian influence to it. After dining for over an hour and just enjoying the food and the view our meal had come to an end. When I decided to come here, I was worried that it would be a traditional resort meal which was overpriced and not anything special. I am happy to report that this is not the case though. 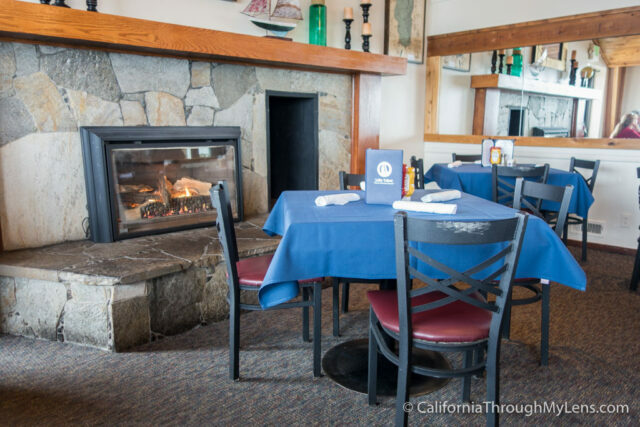 Everything from the food to the staff and the atmosphere was above average, and I have no problem recommending it as an excellent meal in South Lake Tahoe. Let me know if you have been and what you thought in the comments.